Given the mounting evidence concerning marijuana’s healing potential and the fact that legalization in states has not spurred true conflict and only served to produce tax revenue, I think it’s about time for Congress to proactively reschedule marijuana. But will they listen? Currently, marijuana is a Schedule I substance, right up there with bath salts, heroin, and LSD. Ridiculous. The category is supposed to be reserved for drugs that are devoid of medical value – something that certainly doesn’t apply to marijuana. It’s incredibly difficult to remove a substance from the Schedule I list. On Friday, it will have been a year since DC legalized weed. 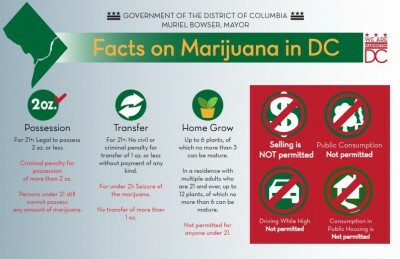 District of Columbia adults age 21 and older are permitted to have up to 2 ounces of marijuana, and people can grow up to 6 plants in their home. No one has died. “Potheads” have not been arrested trying to chew anyone’s face off, or wrestling cops to the ground with supernatural strength. That would be bath salts, which, as I said, are also on the Schedule I list. Instead, overall, marijuana arrests decreased by 85% from 2014 to 2015. Marijuana possession arrests dropped from 1,840 in 2014 to just 32 in 2015. From 2010 to 2015 arrests for possession fell by 99.2%, arrests for possession with intent to distribute were down 85.5%, and distribution arrests decreased by 71.8 percent. Cumulatively, marijuana arrests have dropped over 92% in five years, according to the Drug Policy Alliance’s website. Law enforcement now has the time to pursue actual criminals, and there is more room for those criminals in jails. However, it’s illegal to sell marijuana in D.C., and conservatives continue to ban pot sales there, so imagine what those numbers would look like if congressional conservatives backed off. It’s important to note that Congress isn’t needed to reschedule marijuana. The executive branch of government and the Drug Enforcement Agency (DEA) both have the authority to unilaterally reschedule pot without congressional input under the Controlled Substances Act (CSA). So what’s the deal? Are people in power just sticking to their metaphorical guns, hanging on to the falsely-perceived stigma that has haunted marijuana for decades? How many health studies will it take to prove to officials that it has medicinal value? How much backlash will it take to prove much of the population supports legalization? It all starts with proper education. The evidence is here; we just need to act on it. so since 1971–the feds have NEVER “LAWFULLY” placed cannabis on Schedule, let alone Schedule I. The Shafer Commission did the research on cannabis when congress okay-ed cannabis as Schedule I on temporary status–until the feds research was completed (1971). The Shafer Commission concluded cannabis did not ‘qualify’ for Schedule I, II or III. ( After all aspirin kills 3,500 people a year and is NOT on schedule and cannabis is non-toxic so it kills no one)…. Nixon shredded the Shafer Commission ‘research’ and waged ‘war’ anyways. For the last 45 years the feds have never fulfilled the “lawful” procedure required by the CSA to place cannabis on Schedule (anywhere). Can we -reschedule something not lawfully on schedule? And do we need to? Science, sanity and humanity require cannabis NOT be on schedule in 2016….